Adam Scott, the 2013 Masters champion, had not claimed a trophy since the Colonial in May of 2014, when he was ranked number one in the world. "It feels very good," Scott said. "It was nice to hit some quality shots coming in. Luckily for me, it was just enough." Scott finished 72 holes on nine-under 271 with Spain's Garcia firing a final-round 71 to settle for second by a shot. Americans Justin Thomas and Blayne Barber shared a distant third on 275. 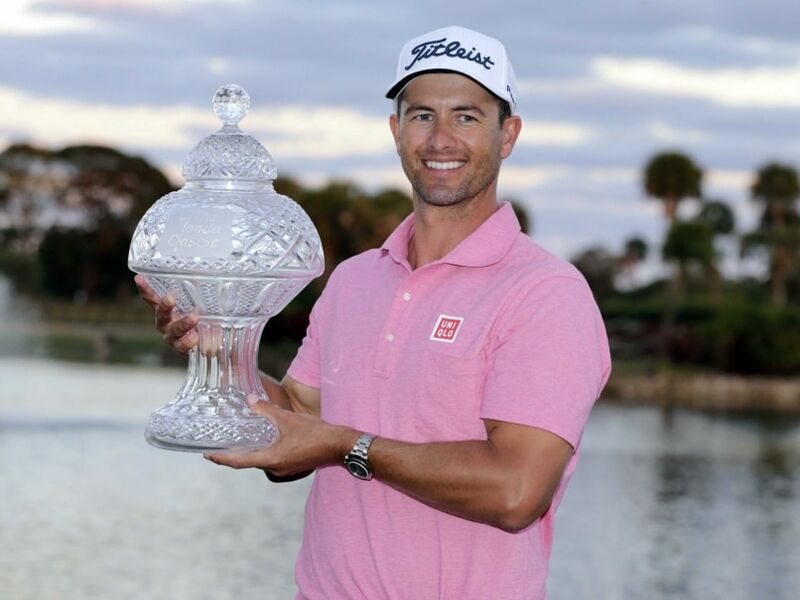 Scott captured his 28th professional title and his 12th on the US PGA Tour, the most by any active player under 40. Ranked 13th this week, Scott won for the first time since the anchored-style long putter he used for years was banned by changes in the rules of golf. "My game has come into a really good spot," Scott said. "We've worked really hard to get it there, made some nice progress in all areas, especially the greens. It paid off this week." Scott opened with a 15-foot birdie putt and added 10-footer for birdie at the par-3 fifth, but bogeys at the ninth and 10th left him where he started and level for the lead with Garcia, who opened with 10 pars. But Garcia made bogey at 11 and Scott dropped his approach inches from the cup at 12 to set up a birdie that put him back ahead by two strokes. Garcia birdied 14 to pull within one as they reached the par-3 15th where Scott had taken a quadruple bogey the day before. But on this day, both would par the hole and Scott would stay on top as both made bogeys at 16. Garcia made another bogey at 17 and a birdie at 18 only trimmed the final margin as Scott made a tap-in par putt for the victory. "I got off to a good start, made one at the first, that definitely relaxed me," Scott said. "Made a lot of good putts. Fortunately it was enough in the end." Scott became the first winner of a PGA event with a quadruple bogey in his 72 holes since Phil Mickelson at the 2009 PGA Tour Championship. For Garcia, it was another disappointing defeat. "It was tough, really difficult golf course," Garcia said. "He deserved it. I don't feel my swing is anywhere near where I would like it. I scored well. "He played better than me. I fought hard. I stayed quite calm. It's never easy. A couple bad shots on a couple of difficult holes and it wasn't good enough."